Project Notes: e.g. "I'm looking for a quote to build a new composite wood deck in Barrington" -Thanks! Platinum Decking in Barrington is your local Barrington deck builder & most trusted Trex deck builder near you! Friends, Family and the Great Outdoors! 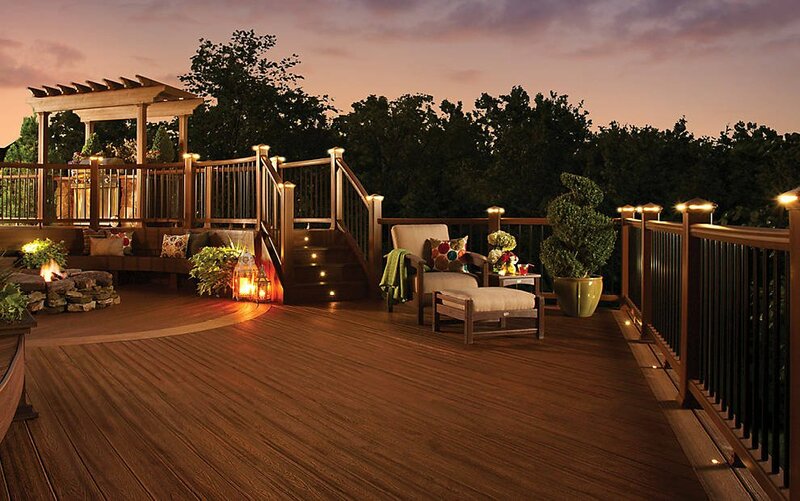 If you enjoy outdoor living or entertaining friends and family, a Trex composite deck is perfect for you. A new Trex deck adds comfort and livability to your backyard while increasing the value of your home. 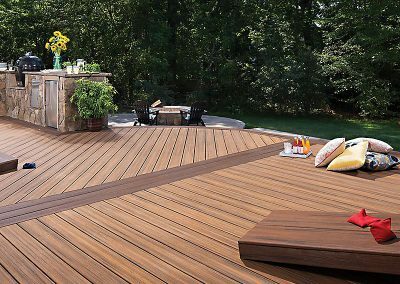 Additionally, a Trex composite deck has a much lower annual maintenance cost than your old wood deck, saving you money. Why wouldn’t you want to enhance your ability to enjoy the beautiful days that summer and fall have to offer? As your local deck builder, we do not simply want to build you a new deck. 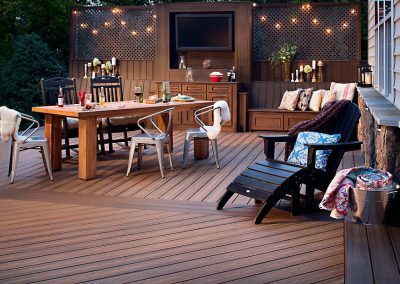 We want your Trex deck to be an extension of your home, a space where you are able to enjoy the outdoors, host the 4th of July party, barbecue with friends and family, or just relax and have a glass of wine with your spouse. What makes Platinum Decking different from the average deck builder near me? At Platinum Decking our sales process is simple. It is based around three major concepts. The first is redefining the deck contractor experience. Second, sharing the long term value and savings of a Trex composite deck. And finally, helping you create an outdoor living area you can enjoy for years to come! 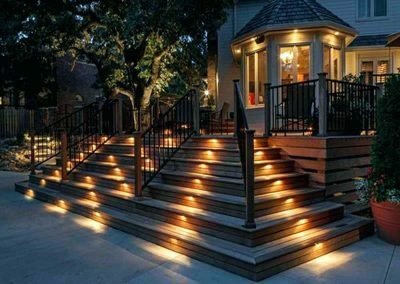 Redefining the contractor experience through exceptional service was the number one reason Platinum Decking was founded. The deck building and construction industries are not always known for their customer service. At Platinum Decking, our customer-first mindset is the cornerstone of our organization. Long term value and savings of a Trex deck are significant in comparison to other options. Over the average life of a deck, a Trex deck will save you $1,000s in deck repair and deck maintenance. Additionally, a Trex deck does not splinter, rot, fade or stain. We believe helping to educate our customers on these areas will make purchasing a composite deck not only cost-effective but exciting! Creating a custom outdoor living area is based you receiving a unique deck tailored to your needs and wants. 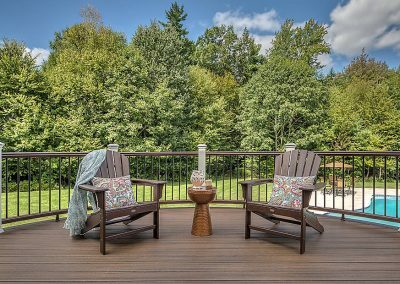 We are happy to suggest new deck ideas or help recommend ways to renew your existing deck. Our vision is that your composite deck is an extension of your home, not simply a surface to store your grill. 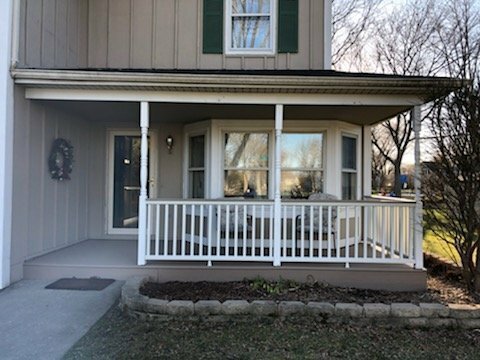 Check out our Palatine deck builder home page if you are a homeowner located near the Palatine, IL area looking for a great deck building contractor! Get a quote now! Your search for a local deck builder near me is complete! At Platinum Decking- Barrington’s deck builder, our teams focus on customer care can take it from here! Click below for a Free Estimate to get your new Trex composite deck built this summer! Our Objective: The owners of Platinum Decking have always enjoyed the outdoors and spending time with friends and family. This is where so much of our passion for outdoor living areas comes from. A Trex deck allows you to spend time with the people you love while enjoying the beauty of the outdoors, all without leaving the local Barrington or Palatine areas. Our Vision: When installing a Trex deck or any low maintenance composite deck, we want to help you design something that is more than just a plain deck. 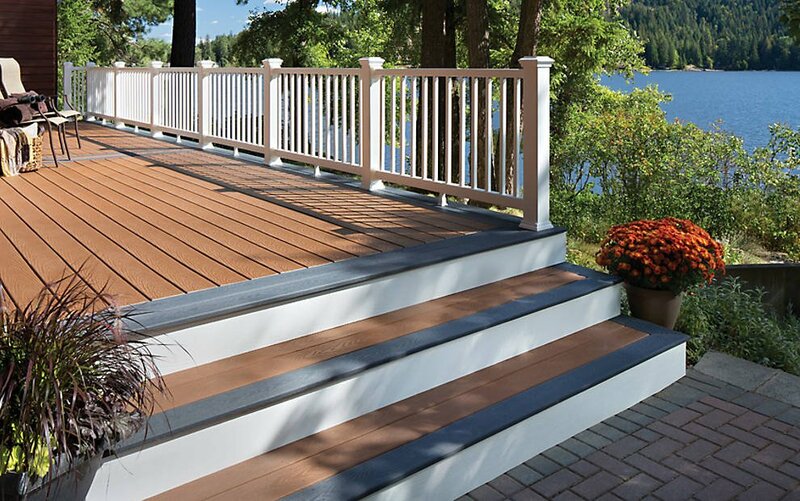 With all the Trex decking color options and Trex railing options, we want to help turn your deck into the centerpiece of your back yard. 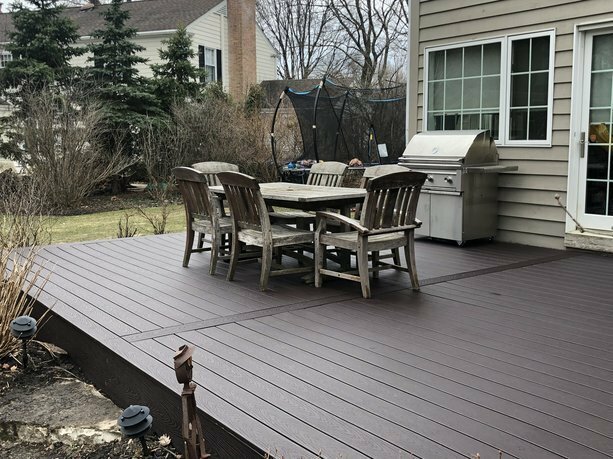 When families across the greater Barrington area think of “Deck builders near me”, we want Platinum Decking to be recognized as the standard for customer service and quality craftsmanship. We are a PROUD member of the Barrington Chamber of Commerce! Platinum Decking is also a PROUD member of the Home Depot PRO REFERRAL Program, enabling us to service the Chicagoland area and Northwest suburbs. Experience – In the last 13 years our leadership team has produced over 250 jobs in the Barrington area. Additionally, we have a combined 30 years of experience in the contracting space. Specialization – Platinum Decking only does composite decks – this enables our quality and customer service to go unmatched. Materials Pricing – Materials on a composite deck make up about 50% of the price. This is higher than almost any service in the contracting space. However, we have negotiated significant discounts off of retail pricing. This enables us to pass those savings to our customers. Manufacturer Relationship – Our relationships with Trex, Azek, and Timbertech enable us to have our employees professionally trained through their special programs. In addition, we are able to service our customers with resources available exclusively to their top contractors. Milwaukee Tools – Milwaukee tools are some of the finest power tools on the market. 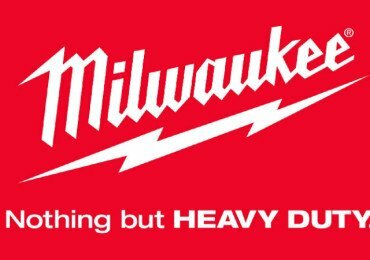 Our relationship with Milwaukee enables us to exclusively use Milwaukee tools to execute at a much higher quality. Customer Service – Contracting is an industry not typically known for customer service. Platinum Decking not only puts our customers first but makes the entire process start to finish easy and enjoyable. 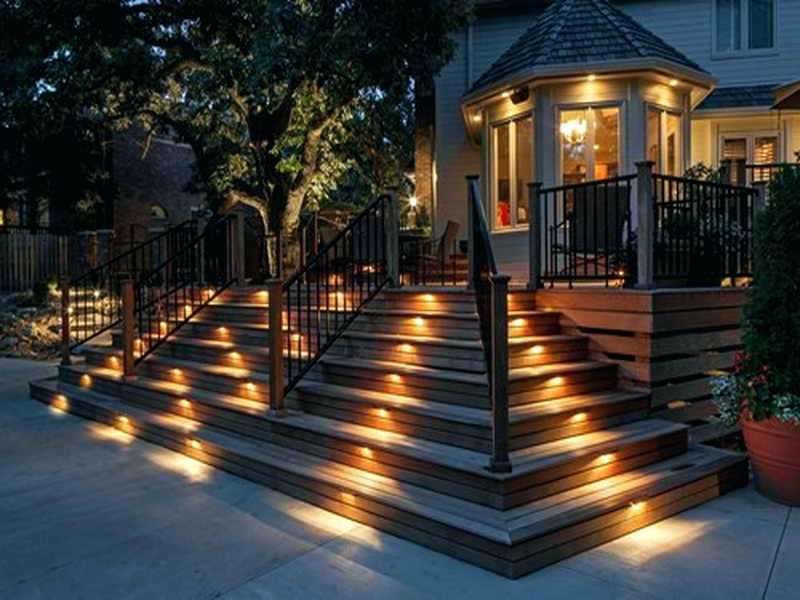 Insurance– Platinum decking has 4x the insurance required by the state of Illinois. We have a $1,000,000 liability insurance policy and full workers compensation insurance. As Midwest winter slowly (very, very slowly) gives way to spring, homeowners begin to emerge from their houses like bears from a cave. Most take inventory of the new season with a quick look out the back door to a familiar sight. It’s not pretty: your wood deck, peeling, splintering, rotten. Emerging from underneath inches of snow for the first time in months, some of the deck did not survive winter. How is this possible? You forked over $1000+ to a contractor. You spent a week staining it yourself. It seems hard to believe that four months of cold weather can do such a number on your deck. Yet, it has. Now you are left with a deck you can’t entertain friends on, let alone space to grill. Many homeowners figure that this search will cure their woes. A contractor will show up and give you all the solutions you need. It will only make you a smarter consumer if you can answer one key question before beginning your search: wood or composite? Our 5 Step Guide will deliver answers you want BEFORE “deck builders near me” is in the search bar. A wood deck is a very bad decision if you live in the Midwest. Snow, sleet or rain (mostly snow) accumulates on the horizontal surface. It sits. And sits. And sits. Illinois and Wisconsin residents will tell you that the snow that falls in October will be here until March. This constant moisture breaks down the “resin” (protective bubble) layer of the stain. Water seeps into the board and begins to rot it from the inside out. The alternative? Trex composite decking. Trex composite is made of 95% recycled plastics, as well as other recycled wood. Moisture of any kind does not have any adverse effects on the composite. 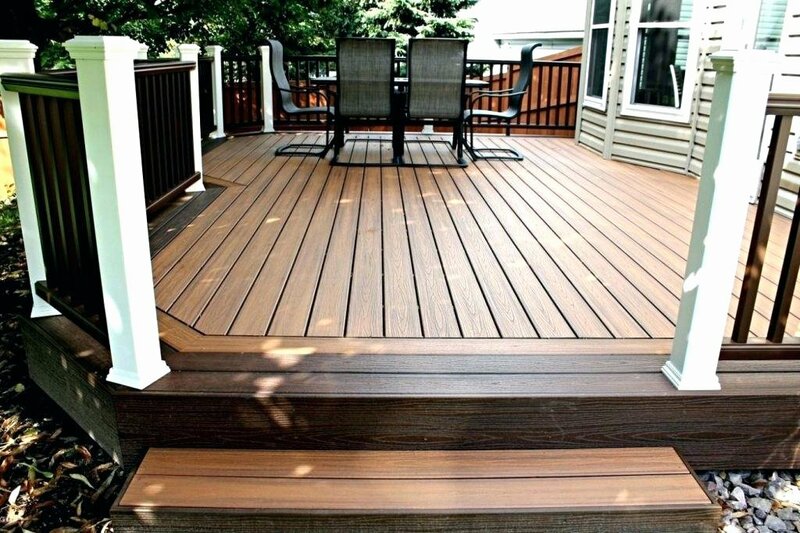 Many composite decking materials are designed to look just like wood, down to the grain. Simply put, the deck that goes under blankets of snow will emerge looking the same way. Every spring you have new peeling, rotting and splintering wood. The vicious cycle of annually maintaining your wooden deck is not pretty. “Deck builder near me” here we come – and only once if you make the right choice. The alternative: Trex composite decking. Trex composite is made of 95% recycled plastics and other recycled wood. Moisture of any kind does not have any adverse effects on composite materials. 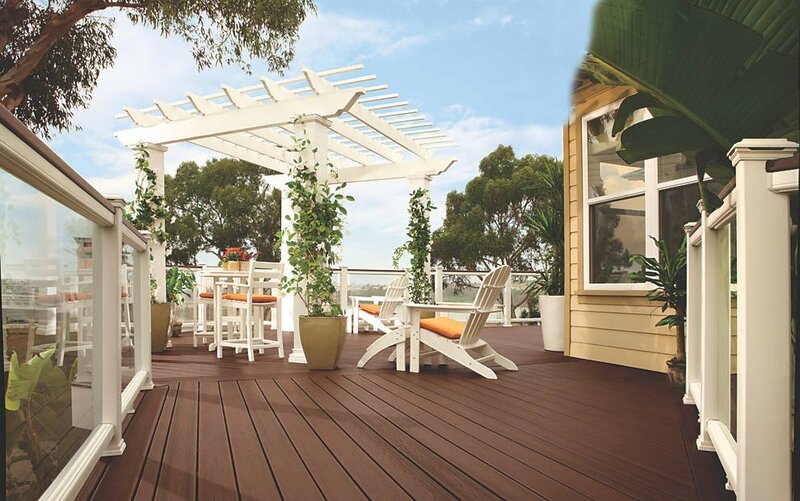 Certain composite decking materials are designed to look just like wood, down to the grain. The deck that goes under blankets of snow will emerge looking the same way. How Much Did Your Composite Deck Cost? How Much Did Your Deck Cost? 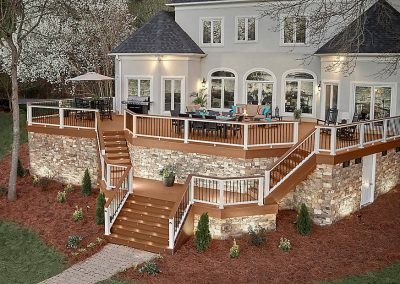 This is a tough question to ask your neighbors and tough for your local deck contractors to answer because, much like many other home improvement projects, decks can be unique in both size and features. Square footage, framing, stairs, features, and more can all influence the final investment. You can get other price breakdowns and comparative costs at HGTV. Does Composite Decking Scratch Easily? A question to answer a question: if you are a homeowner with hardwood floors, does it drive you crazy when you notice a scratch? Those who answer yes are wise to consider what options they have when considering composite decking. Though experiences always vary, the general industry consensus is that Trex Transcend, the top tier line of decking products for Trex, is the most scratch-resistant material on the market. It is incredibly difficult to scratch at all. The lower tiers that Trex offers, Select and Enhance, still offer scratch protection. However, it is very likely your deck will get scratched by plastic chair bottoms, animal claws and teeth, and more. The same can be said for products offered by Azek and TimberTech. 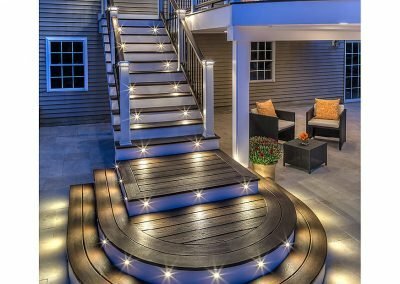 How Do You Maintain A Composite Deck? 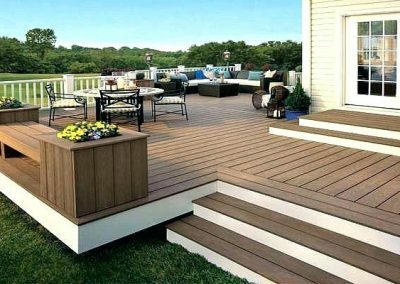 Chicago Composite Decking – Low To No Maintenance! 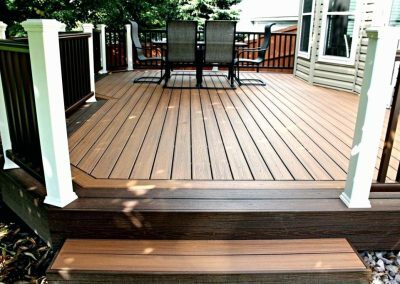 Arguably the greatest thing about a composite deck, compared to a wood deck, is the maintenance is on the no-to-low side of the spectrum. Generally speaking, a hose wash or power wash each spring or after a “dirty” season is all you need to do to keep your deck looking as good as the day it was installed. Additionally, moisture that sits on it for months (i.e. snow) will not affect the deck. Still, most homeowners shovel it off as often as their driveway. Residents from Wisconsin, Illinois and the rest of the Midwest are moving rapidly towards composite decks, and have one concern: will shoveling scratch it? Not at all, if you install your deck with the right brand of composite material. Some brands will scratch if you aren’t careful; however, one industry consensus has been a very reliable, scratch-resistant product called Trex Transcend. Finally, you can always hire a company who provides that service or worker to powerwash your deck annually. How Do You Clean Your Trex Deck? 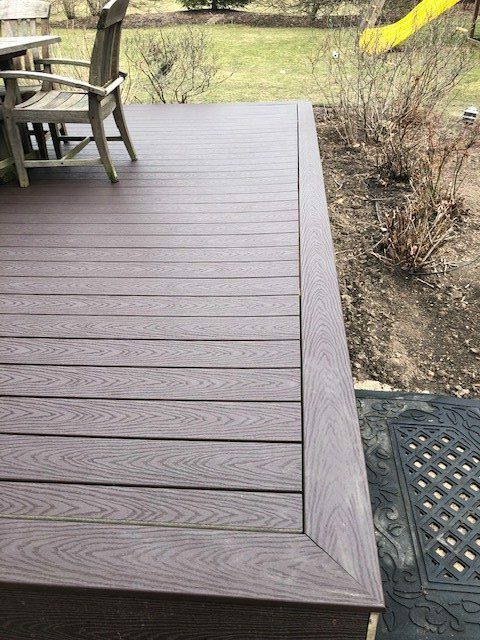 One of the biggest reasons why composite decks are a trending home improvement in Chicago is because they are a low-to-no maintenance solution. An annual wash is all you need to do keep your deck looking brand new. When cleaning your Trex deck, clear everything off the deck. This may include items, furniture and soil from potted plants. Wet the entire surface with a hose and thumb. Grab some warm soapy water and a soft bristle brush, and make sure you scrub each board. A final, thorough rinse will have your deck looking great for the new season. Additionally, you can use a pressure washer. It is recommended you use a pressure washer on its lowest level – and a 3100 PSI or lower pressure washer is recommended. Use soap in the wash and, if possible, use salt water – hard water minerals may leave residue. Wash and rinse evenly over all areas, and rub the soap into each board with a soft bristle brush to ensure a superb clean. Rinse evenly and let dry naturally. 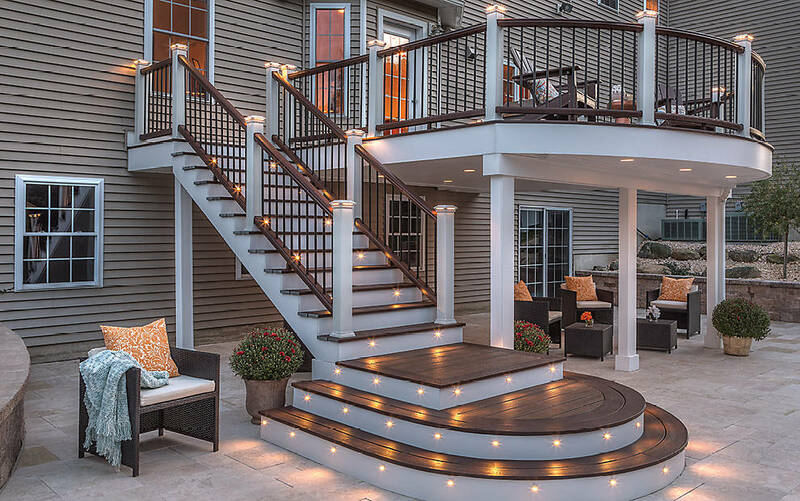 Does a Deck Add Value To Your House? Add a Deck, Chicago Deck Builders! 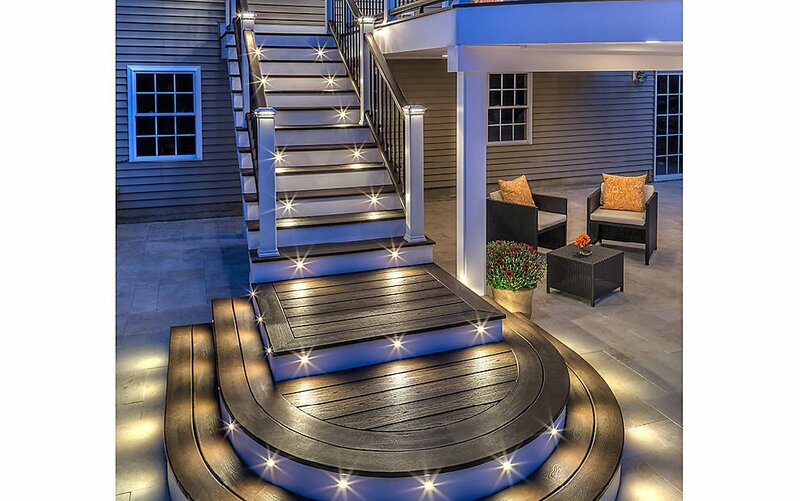 In short: yes, adding a deck will add value to your house. What type of deck, how large it is, and how well it’s maintained while waiting to close are all factors that can change its added value. The biggest perk: a deck will add square footage to your house. You can add this footage to the house’s bottom-line total on square footage. That alone is a big win for some house sellers. The type of deck installed also makes a difference. 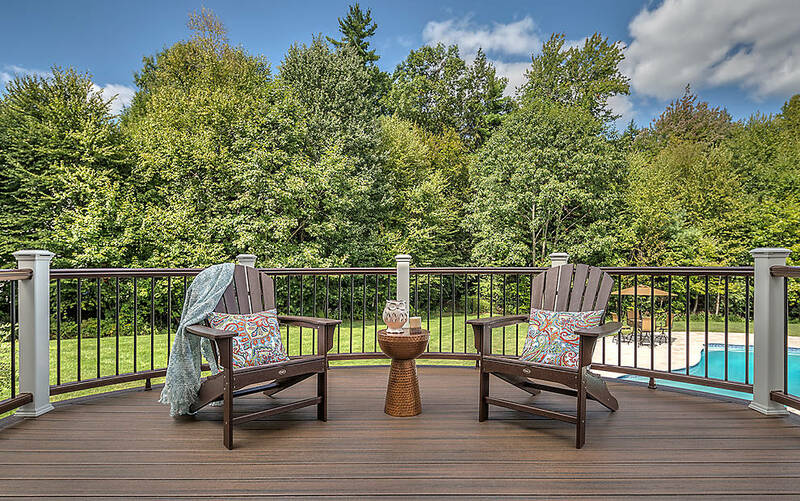 If you are confident the house will sell immediately, or you are already in closing talks, a wood deck will give you the most return on investment. However, if you are half a year or more away, a composite deck is the way to go. It will not degrade at all and the ability to tout a deck that will last 25 years is much easier than a deck that will need to be stained yearly. Is Trex Decking Slippery When Wet? In general, it is highly advisable that you do not run on slick surfaces of any kind. While Trex has made some incredible innovations to their product lines in the past 5 years, make no mistake – a slick, horizontal surface that is coated in a moisture-proof sealant will be slippery. No matter who you find when searching “deck builder near me” this will be true. That being said, the majority of Trex customers have reported that they have found the deck no more slippery when wet than a regular wooden deck. When dealing with any horizontal surface that is covered in water, take your time and be careful. You can always look into adding anti-slip treading or other materials at department stores like Lowe’s or Home Depot. You can also ask your local deck builder for suggestions. Trex composite decking is made of a mixture of wood and recycled plastics. Trex composite boards are coated on 3 sides with a sealant that protects the board from moisture, stains, scratches and more. Trex warranties all products for 25 years. A Trex deck is expected to last at least 2-3 decades and is perfect for climates where heavy snowfall and rain are an annual occurrence. Trex boards are engineered to be installed and fastened side-by-side, so there are no visible screws. 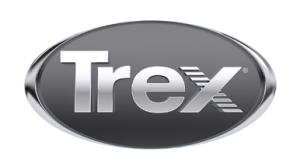 Trex is considered the founder of the composite decking industry. 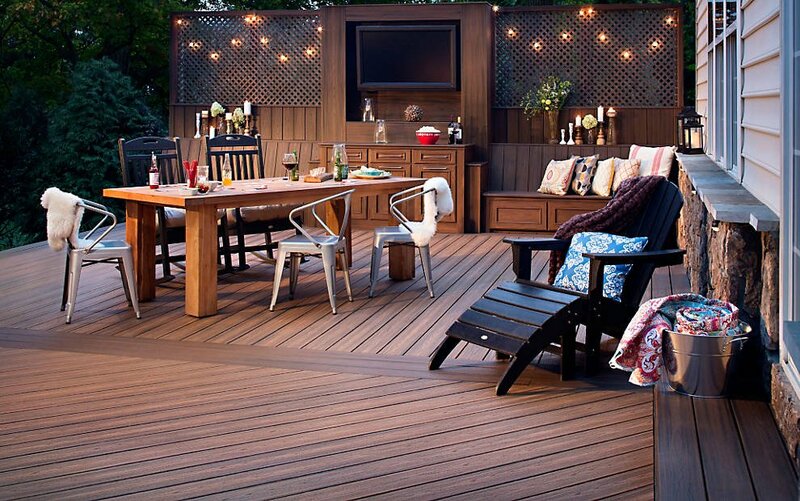 It has three different lines of decking products, in addition to many other outdoor living area products. 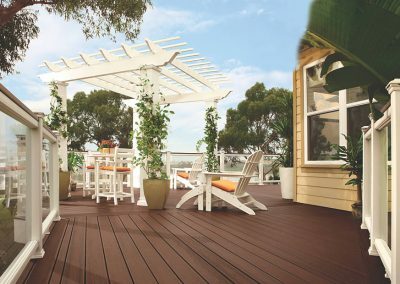 The top tier of Trex decking, Transcend, is widely considered to be the most authentic looking, matching a wooden board look down to the grain. Ask your local deck builder what materials they carry, and if they carry Trex. How Much Is Composite Decking vs. Wood? First, the actual difference in price. This price difference may change depending on if you are buying the materials and building the deck yourself, or what sort of deal the local deck builder you hired has with his or her supplier. Generally speaking, composite boards will be anywhere from 3-5 times as much as pressure-treated lumber. Second, the reason for the difference. Longevity, maintenance and amount of exposure are important factors when comparing the initial costs of composite and wood materials. Wood’s longevity is dependent on how well it’s maintained year over year. Annual or biannual staining, painting or coating is required. Composite, however, is low-to-no maintenance. If you make the right decision when searching “deck builder near me,” a hose wash or power wash each spring will keep your boards looking as new as the day it was installed. Can I Power Wash a Trex Deck? Firstly, yes, you can powerwash a Trex deck. However, you should keep the level (color) of the power washer on its lowest. Keep the tip of the gun at a distance of at least a few feet. There are individuals you can hire to power wash, you can do it yourself, or particular companies offer power washing annually if you decide to resurface your wood deck with new Trex, or build a brand new composite deck with them. Even though a low-level power wash is always recommended, there are situations where you will only need a hose, a thumb and/or a finger to get the job done each Spring or Fall. Some Trex owners wash every season, some only annually. Talk to your local Ace Hardware, True Value, Lowe’s or Home Depot to get advice on whether tarping over the winter is excessive or useful. 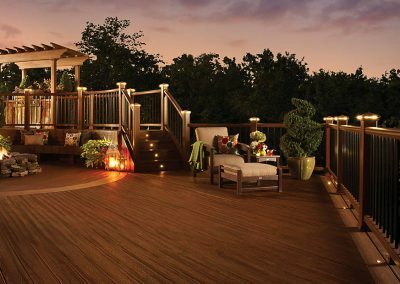 Why build a Trex deck with your Barrington deck contractors? See for yourself the difference between Trex Decking vs Redwood, Cedar, and pressure treated lumber over time! Composite decks are very low maintenance. However, A Trex deck only requires an annual hose down and cleaning. For instance, Unlike traditional wood decks that will begin to fade and stain in the first few years, a Trex deck has a 25-year fade and stain warranty. 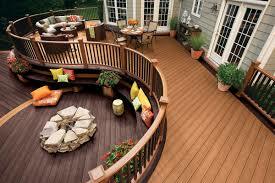 Unlike a composite deck, Wood decks are susceptible to various insect and wildlife damage. This can lead to structural damage and safety hazards. 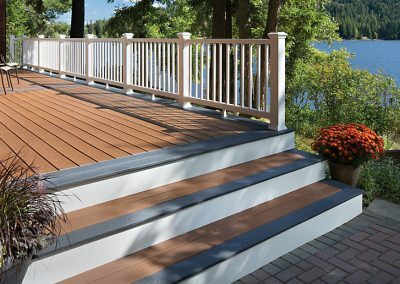 In short, Composite decks will never rot or splinter, creating a safe place for everyone to enjoy the great outdoors safely! Trex composite decking materials are locally sourced, reclaimed wood that would have otherwise been thrown into a landfill. Therefore Trex composite decking uses reclaimed wood and sawdust, ZERO trees are cut down to make any Trex composite decking. Furthermore, the recycled wood/sawdust is combined with a variety of recycled plastic ranging from shopping bags, newspaper sleeves, sandwich bags, and even dry cleaner bags. For every 500-square foot, Trex composite deck built, 140,000 plastic bags are used and saved from going into our local landfills! Check out how EASY it is to keep your new Trex deck looking GREAT for decades to come!! Click here to read more about how to keep your Trex deck looking like new! As your local Barrington Deck builder, we are proud to offer Trex Deckings unmatched 25-year warranty. 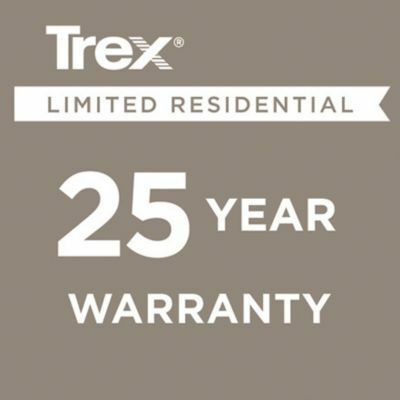 All Trex decking we offer is covered by an industry leading 25-year limited residential warranty. 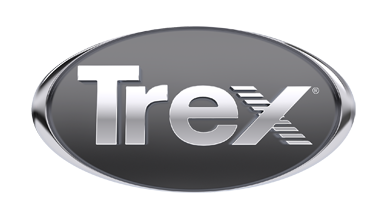 Trex has built its brand off their exceptional warranty and service. 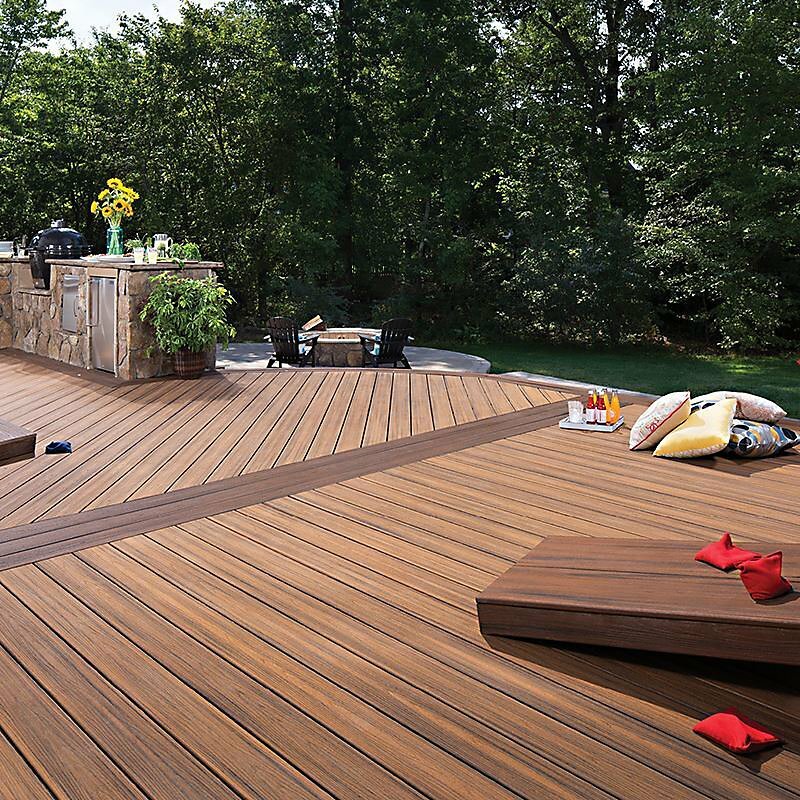 In addition, our Trex decking also comes with a 25-year fade and stain warranty. In conclusion, you can rest assured that your new investment will be protected for the next 25 years! 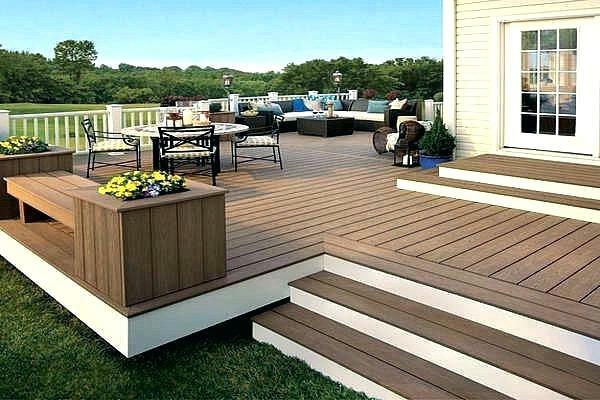 PVC is also an alternative low maintenance decking solution. 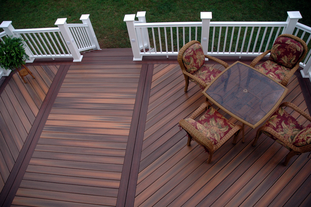 Since it is 100% PVC, it does not have the issues a traditional wood deck has. Therefore it is not Rot, Split, and is not susceptible to insects or terminates. With that said, it has its list of challenges. Platinum Decking has put together a list of home improvement stores in the Barrington area. This is to help with projects around your home to compliment your new Trex deck outdoor living experience. We want to thank you for letting us be your local Barrington deck builder. We would love some of your feedback! Please feel free to share your experience with us! Platinum Decking- Your local Barrington Deck Builder, would like to thank you for the opportunity to earn your business. Platinum Decking services homeowners outside of just Barrington. If you search “deck contractors near me” in any of the following areas, Platinum Decking is honored and able to build your new deck. Platinum Decking is also hiring employees in the greater Barrington and Palatine area. We are looking for skilled deck builders and with deck contracting in this past. Above all, we want highly skilled individuals to help us deliver on the promise, to deliver the highest quality product on the market to our customers. 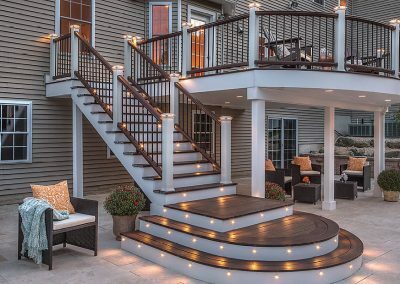 Platinum Decking is your local deck builder in the Chicago suburbs!